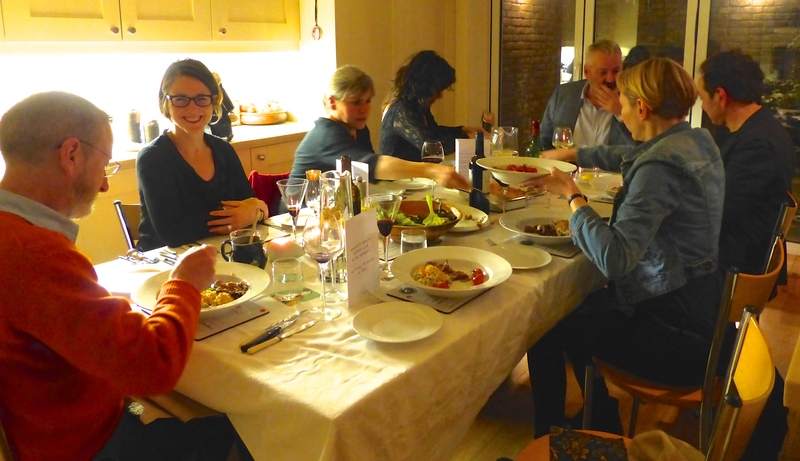 It’s been too long since the last Naughty Habits Supper Club, so we reconvened on Friday. This time we had some guests we’d never met before, so it felt very grown up and slightly daunting. Although it turned out I had met a couple of Jenny’s invitees in passing at least at a couple of her parties over the years. All the guests were charming and conversation (not to mention wine) flowed all evening. 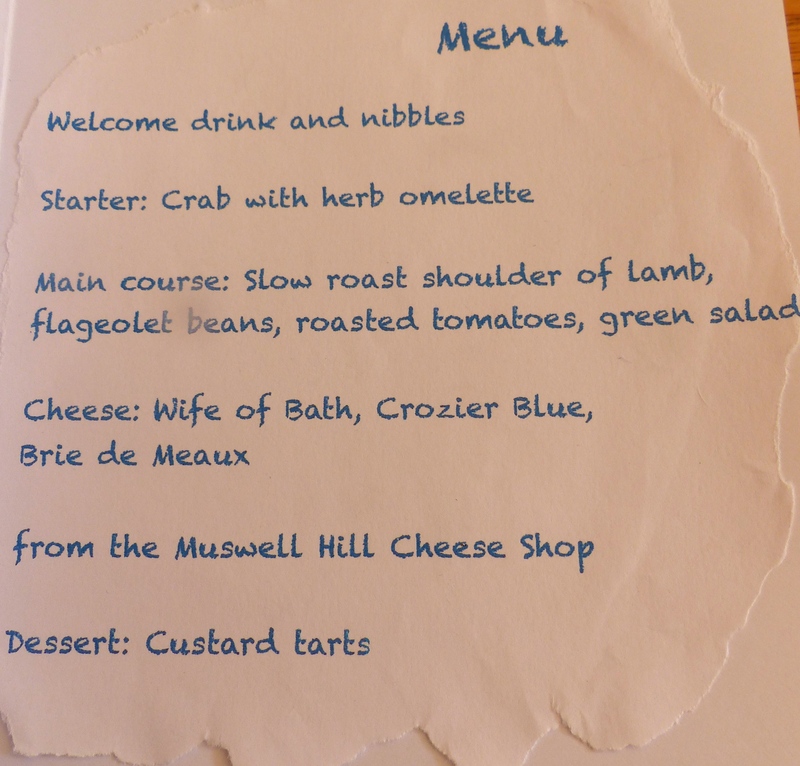 Although my status as lapsed vegetarian means I have vowed to try pretty much anything, neither tripe nor tongue appeals particularly, so they were never going to be on the menu. But the above request did rule out the drunken prune tarts, which are made with almond cream and which I LOVE. We greeted the diners with a Sloe Gin fizz (sloes harvested in Totteridge last autumn) and some olive and pecorino breadsticks. 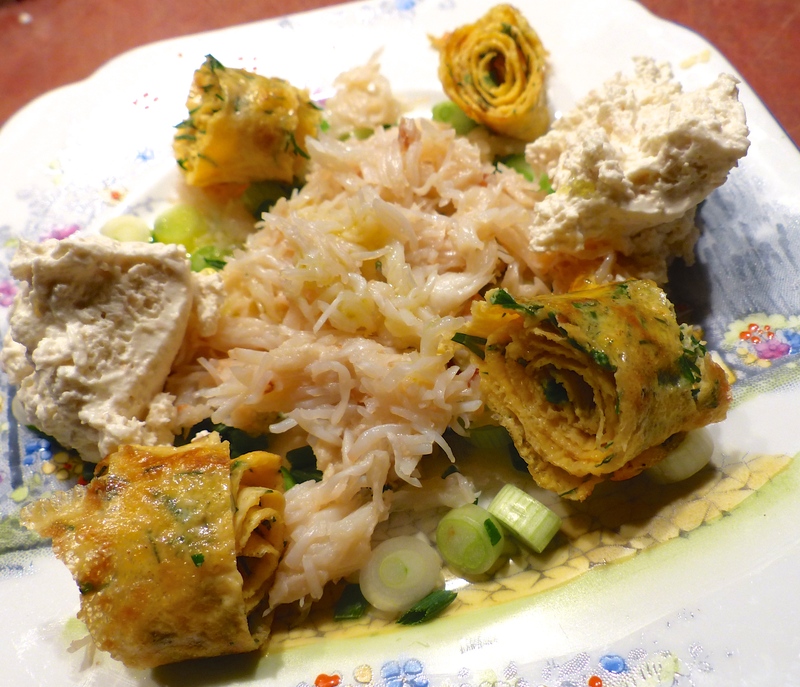 The starter was this crab salad with herb omelette. I loved listening to the guests anaylse the dishes – they quickly spotted the horseradish in the accompanying cream, which complements the crab beautifully. The main course was a slow roasted lamb shoulder, cooked for eight hours. The lovely men at the Midhurst Butchers, who always take an interest in my recipes, advised against doing a leg joint for this recipe and they were right. The lamb did exactly what it was meant to – falling off the bone, ready to be served on a large platter with a herby lemony dressing and a litle bit of crumbled goat’s cheese. With that, I served a flageolet bean casserole (I could eat this for every meal, but probably not socially acceptable to do that), some roasted baby tomatoes and a big green salad. 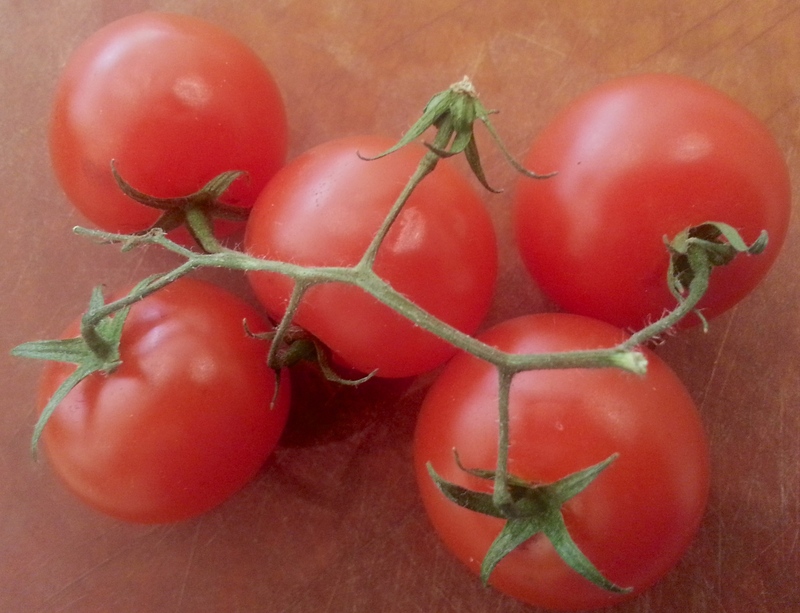 The tomatoes are fab. They are drizzled with olive oil and balsamic vinegar, seasoned with salt and pepper, then roasted on the calyx for 10 minutes. The calyx is the green bit. Who knew? Here are some I haven’t roasted yet. Then there was cheese from the Cheese Shop in Muswell Hill (@CheeseShopN10), with apricot & oat and prune & cardamom breads, practising what I learnt at the Bertinet Kitchen last week. 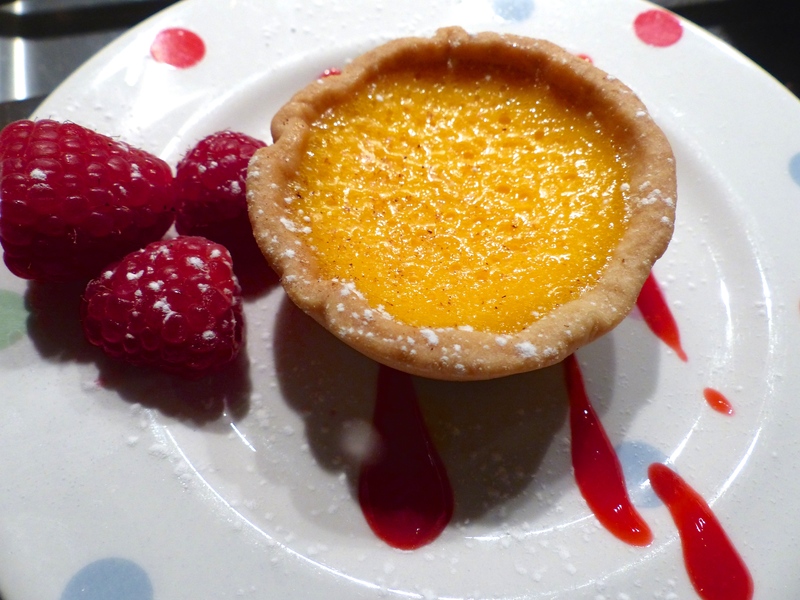 Little custard tarts for dessert, with raspberry coulis and a few raspberries. For readers who don’t know, we call it the Nunnery because Battenburg Towers is in fact part of an actual former convent. Apparently the nuns were moved on about 14 years ago and now we live here. The Post Office won’t let us call it the Nunnery officially, because it seems you are not allowed to have “The” in the name of your home, unless you are very important, which we aren’t. But they can’t stop us using the name for fun. Hopefully the Naughty Habits bit speaks for itself. I had a lovely evening, ably assisted by Jenny of Silver Screen Suppers, and I think the guests did too. Already plotting the next event!